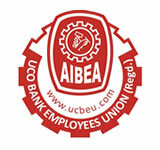 Home > News > News > On Bipartite AIBEA welcomes Government’s advice to Banks to initiate the process of negotiations for next wage revision and conclude it prior to the effective date i.e. 1-11-2017. On Bipartite AIBEA welcomes Government’s advice to Banks to initiate the process of negotiations for next wage revision and conclude it prior to the effective date i.e. 1-11-2017. A meeting of the Office Bearers of AIBEA was held today in Chennai to take stock of the various developments taking place in the banking sector as well as to take further decisions on our current struggle against unilateral actions of Associate Banks of SBI in changing the service conditions of the employees in violation of the existing bipartite settlement. During the course of the meeting, AIBEA Office Bearers took note of the communication dated 12-1-2016 sent by the Finance Ministry to the IBA and all the Banks to initiate the process of negotiations for the next wage revision settlement and to conclude it prior to the effective date i.e. 1-11-2017.